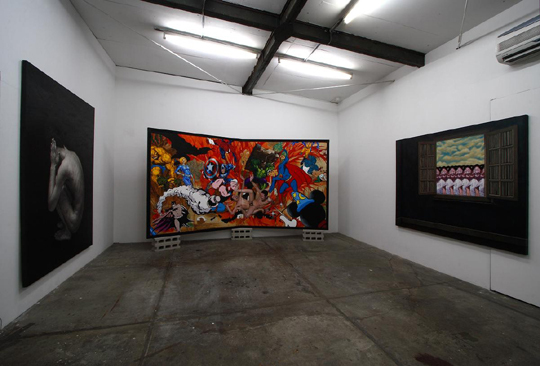 We are pleased to announce YAMAMOTO Ryuki solo exhibition at Mizuma Action starting from November 26th, 2008. This is his first show in two years. Yamamoto was born in 1976 in Mie. He is known for detailed photo realistic self-portrait with full of humor. He calls his works, “super privatism painting,” and he often uses self-portrait as a device to translate his question and discovery in this society and in his life onto picture surface by depicting small sized several hundreds of him or one giant self-portrait. In this exhibition, entitled “SHI SHIN KEI* -Super Privatism-,” what is reflected on the scenery in Yamamoto’s heart? Of course there will be full of Yamamoto! When we walk around the city, we sometimes are shocked to find people wearing emotionless masks or fawn face. However, we hardly have a chance to notice that we have the same facial expression as they do. 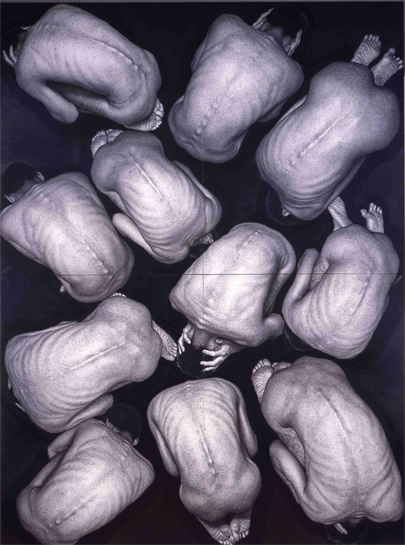 One of Yamamoto’s works, “Untitled (Back),” in which a number of naked Yamamotos hunching over and covering their ears, might remind us of those states we are in. Its strong contrast and sharp criticism drew with pencil were superbly eased by Yamamotos’ naked buttocks and ultimately we are overwhelmed by its simple composition. 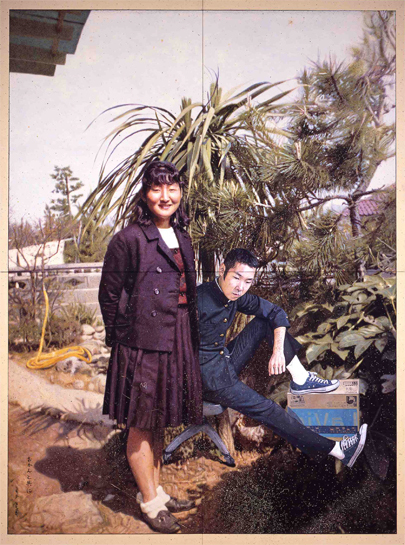 His other artwork, “With Mother” was created based on the shocking fact that his mother in a student photo exactly looks like a girl whom he fell in love with. In this work, the artist with deadpan face stays beside his mother a smile and it can be an epic work refers to Anima in Yamamoto way. Yamamoto can be a good comedy writer who casts performers into the situation he sets up as well as a performer himself, then leads audiences to his story and laughter. He used to aspire to be a manga artist, and grew up in Kansai area where comedy and mirth take root. This background might have influenced Yamamoto. His yearning for TEZUKA Osamu and familiarities with Yoshimoto** style comedy, are secretly melting together on his canvas. Yamamoto mentioned his ideal artwork as “one frame painting.” And it signifies his strong belief in the power of expression in painting. His story and sense in comedy, concentrated in one painting, evolve every year and increase intensity. Its strength is powerfully connected with his approach to self-portrait. To make realistic sense, Yamamoto uses his own nature rather than other’s, and it adds purity and cogency to his works. The anxiety, pain, arrogance, confusion and apathy expressed in his self-portrait were obviously the things Yamamoto recognized within him, and the moment when we synchronize with those within ourselves, that is when we become able to share his “SHI SHIN KEI.” Thus Yamamoto’s self-portraits are “super privatism,” yet they have universality at the same time. 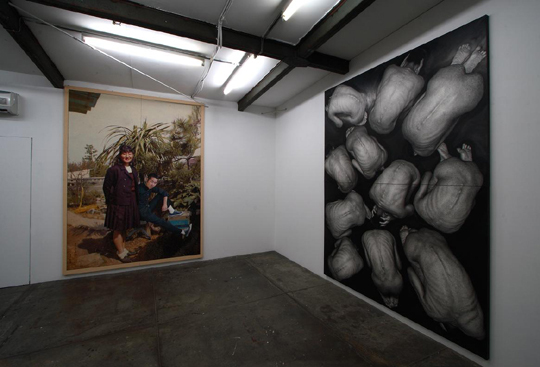 However his work has peculiar impression, I believe that we as modern human feel sense of intimacy in it. **The formal name is Yoshimoto Kogyo Co., Ltd., is a major entertainment company based in Osaka, which is in Kansai area. Many of comedians belong to Yoshimoto.